We just can’t help falling in love every time we see the pictures of this beautiful ceremony. Peonies are the perfect guests at an over-the-top, romantic wedding. Spoiler alert: she said yes! This mind-blowing wedding featured thousands of peonies. Russian wedding planner Ksenia Afanasyev and florist Julia Shakirova were the ones who designed this wedding. The outdoor ceremony took place in a peony themed amphitheatre. Rose pink peonies decorated the place. Thousands of peonies filled the pool inside a repurposed greenhouse. That was where the wedding guests dined underneath living trees with crystal leaves. We supplied the varieties Salmon Chiffon, Coral Sunset and Sarah Bernhardt. 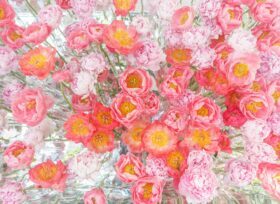 In total, over twelve thousand superb quality peonies in shades of sensual pink and passionate red perfected the design. We’re proud our peonies made a special day even more glamorous and magical. And we’re sure bride Victoria and groom Vyacheslav are peony fans for life! My Peony Society supplied the highest quality peonies in cooperation with 7Flowers and OZ Export.